Everybody loves something crunchy. Here is a super easy Kale chip recipe everyone can make! You don't have to go over the top to have a tasty chip. Simplicity is one of my favorite things in the kitchen because there is usually so much going on. A simple chip is still simply delicious. In this recipe I do not use any nuts or seeds. But that would make a tasty chip too! I'll share with you a few optional things you can do to this recipe to fit your taste buds needs! Two large bunches of Kale. First I stripped the leafy green from the thick stalk. I used multiple types of Kale in this batch. 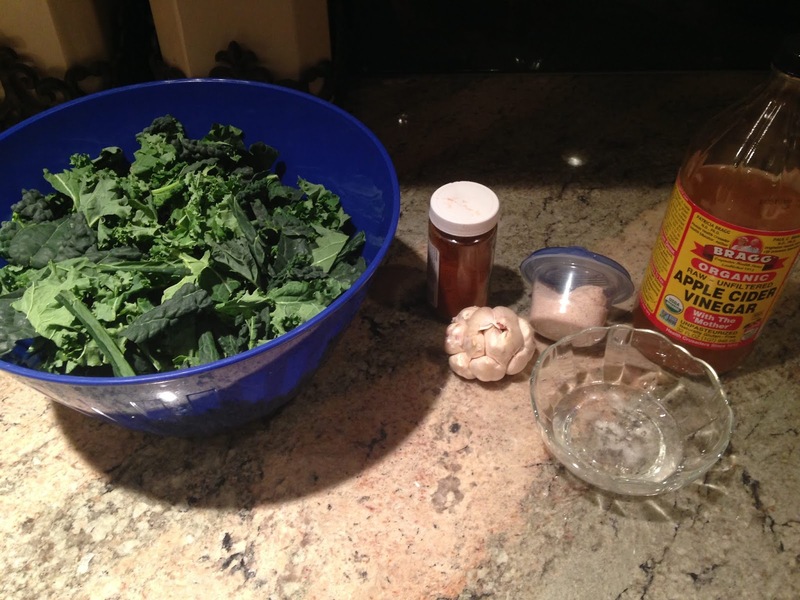 You can also try using any other greens such as chard, collard's or cauliflower greens. I coarsely chopped the greens and tossed them into a bowl. You don't want the pieces too small as they will shrink while dehydrating. Next, I peeled the garlic and minced it. I used my Cuisine art food processor but you can do this by hand or a Ninja is pretty helpful too. I peeled a couple more bulbs and made a big batch of minced garlic. I like to use it to make infused oils and for other recipes. When I do this, I do not worry too much about perfect portions and measure out about how much looks like one bulbs worth. So if I minced five bulbs total, I would pull out about 1/5 of the minced garlic bulk. Next, I take a 1/4 cup of liquid coconut oil and pour it over the Kale. If you do not have coconut oil you can also use olive oil. I add the garlic along with a pinch or two of salt and a pinch or two of cayenne powder. Then I add a tablespoon of ACV. 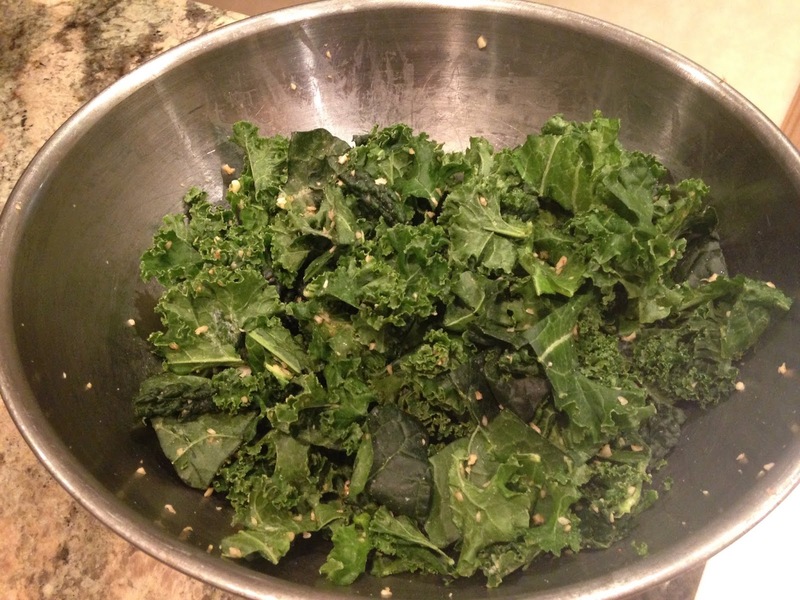 Once everything is in the bowl, I massage the Kale with all the other ingredients until I feel everything is well coated and evenly distributed. Sometimes I like to add nuts or seeds to this recipe. When I do this, I take about 1/4 cup of soaked cashew (usually I have pre-soaked them for at six-twelve hours) add them to my Vitamix along with all the other ingredients and blend until smooth. This doesn't take much longer than a minute or two. I'll add a tablespoon of water at a time if I feel the sauce is to thick and needs a little help blending. Feel free to add about a tablespoon of nutritional yeast to the blender also! If you do not have cashews, add ground flax instead or soaked sunflower seeds! Once you have your sauce, pour over the greens and massage them until they are evenly coated. Then simply lay your greens on your dehydrator sheets, drizzle any remaining sauce over them and place the trays in the dehydrator. I usually use two trays with this batch. Do not worry about the greens being perfectly spaced out. These chips will not need much longer than 8-12 hours. I set the dehydrator for 110 degrees and I check on the chips within the next four hours. I'll get a good idea for how much longer they will need, maybe only 2-4 hours more. Another fun idea is to eat them at this stage! they are soft and warm just like collard greens and make a very nice meal. Let them go in the dehydrator till they are crisp and chippy. When done, eat and enjoy! 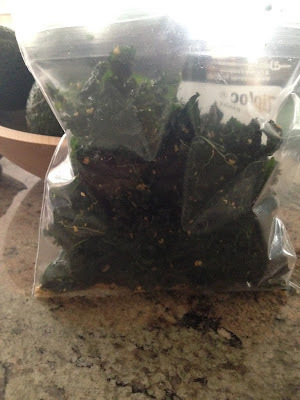 Let me know what you like to add to your Kale chip recipe in the comments below. Share how your chips turned out too! There are so many fun things you can do with a dehydrator! All sorts of chips and crunchy things you can fill your pantry with! Look forward to my Pizza Flax Crackers recipe in the next day or two!